Jennifer Blanke, AfDB Vice-President, Agriculture, Human and Social Development (third from left), participates in the Closing the Deal panel alongside partners on Day 4 of the 7th African Green Revolution Forum in Abidjan. Agriculture projects developed for Africa must be bankable and incentivized in order to attract private investors who seek to make profit, and the youth who seek employment. This was the key message shared by Jennifer Blanke, Vice-President, Agriculture, Human and Social Development at the African Development Bank, on Thursday at the 7th African Green Revolution Forum in Abidjan, Côte d’Ivoire. 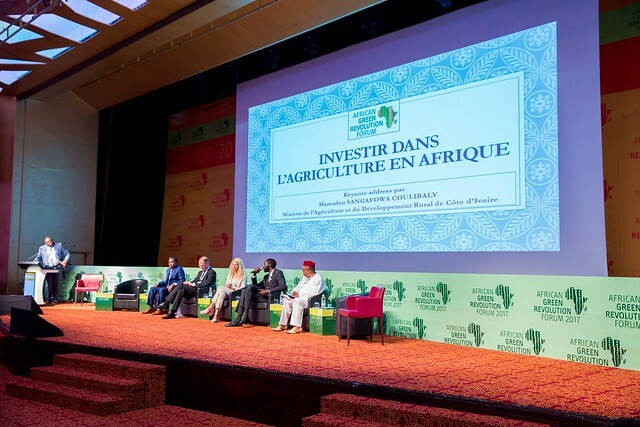 Blanke was part of a panel in a session titled “Closing the Deal – Investing in African Agriculture”, alongside Senegalese Minister for Agriculture, Papa Seck; Sani Dangote, Vice-President of the Dangote Group; and Krim Lotfi Senhaji, CEO of OCP Africa. Blanke told the session that the narrative around agriculture in Africa should shift from farming being considered as a way of life to a business venture. “Traditionally there is an expectation for big agricultural projects from governments. Now more than ever we need to recognize that financing from the private sector is also necessary for Africa’s green revolution to take shape,” she said. She said that the African Development Bank will invest US $24 billion over the next ten years into agriculture, which she also said is not enough to lead a prosperous green revolution in Africa. Blanke conceded that agriculture is not free of risk for business ventures, and called on organizations and governments to offer guarantees and insurances for agribusiness. “You cannot expect zero risk in agriculture; so one of our roles at the Bank is to provide risk guarantees for agribusinesses. This is aimed at reducing the perceived sense of risk on the continent, which exists mainly because of climate change,” she said. In his keynote address, the guest speaker at the session, Mamadou Sengafowa Coulibaly, Minister of Agriculture and Rural Development, Côte d’Ivoire, said that the continent attracts large flows of investments, but continues to suffer from poverty. This, he said, is because emphasis in agriculture is placed on exporting raw materials and not production of quality products with value addition. “Africa is the cradle of humanity. We have a lot of natural resources, but more than 50 years after independence, Africa is the place where we have the largest number of poor people in the world,” he said. In her address, the President of the Alliance for a Green Revolution in Africa, Agnes Kalibata, noted that it is critical to monitor the performance and graduation of small agri-businesses in order to understand the underlying challenges to the continent’s green revolution. She also highlighted the role of AfDB in advancing agribusiness through its Feed Africa Strategy that has foreseen transformation in the sector. “AfDB has indicated a steady willingness to priorities agriculture through its programs such as the Feed Africa project and the High 5s, which seek to transform the sector into a leading driver for economic growth and development of Africa,” she said. Feed Africa is the African Development Bank’s strategy for agricultural transformation on the continent. Officially launched in 2016, the strategy extends to 2025. In 2015, the Bank’s President, Akinwumi Adesina, launched the High 5s – which are five development priorities for the institution: Light up and power Africa; Feed Africa; Industrialize Africa; Integrate Africa; and Improve the quality of life for the people of Africa.